naked cricket: Sachin Tendulkar at Madame Tussauds. Sachin Tendulkar at Madame Tussauds. Awright...I'm coming up centre-stage to take the potshots and catcalls...is Sachin burning from both ends? Time running out? He's the Bhishma pitamah of Indian cricket - fading by choice only. SB, still, sachin was not a myth. his aura fades tho. SR, 'better to burn out than it is to fade away', neil young. mohit, and if sachin doesn't hear them say it, he'll have them clear his ear wax. 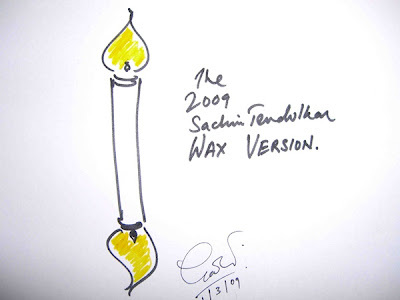 sam, dhoni the long haired version, waxing eloquent, could be the first talking statue at T.
there couldn't be a more apt defn of sachin, but a candle burning on both ends!